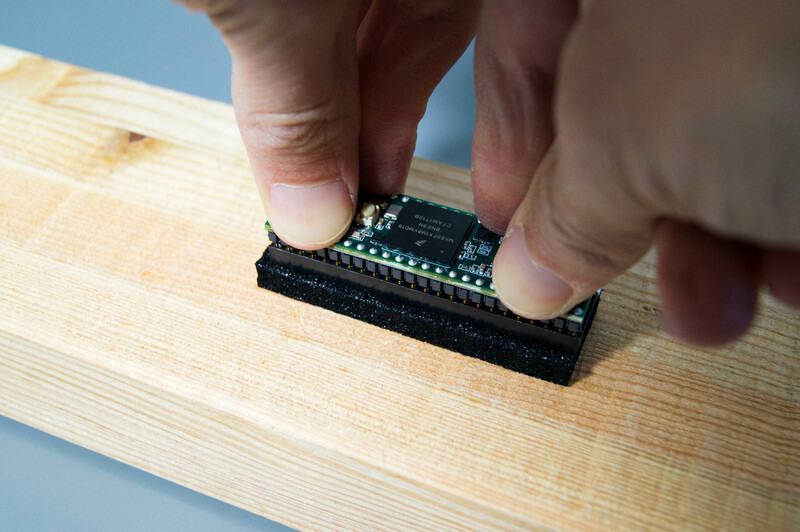 Optionally a toothbrush to clean residual flux from the PCB after soldering (don't use for your teeth after that). 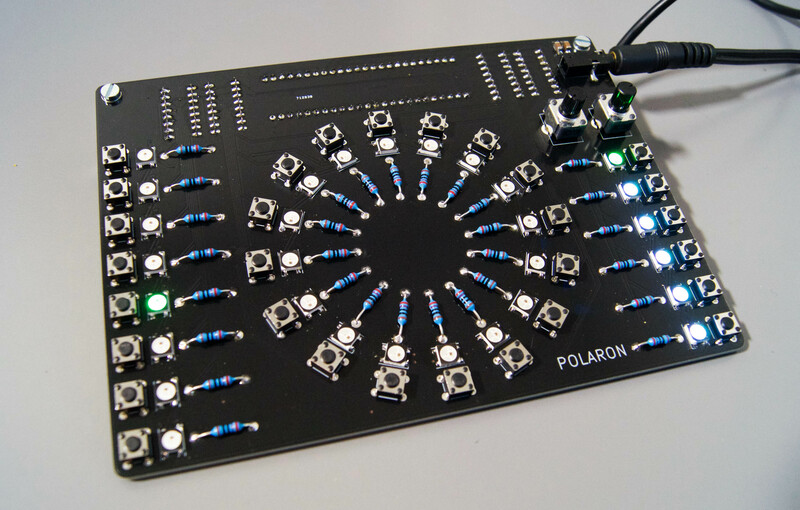 If you've never soldered before, you shouldn't build the polaron as a first-time project. 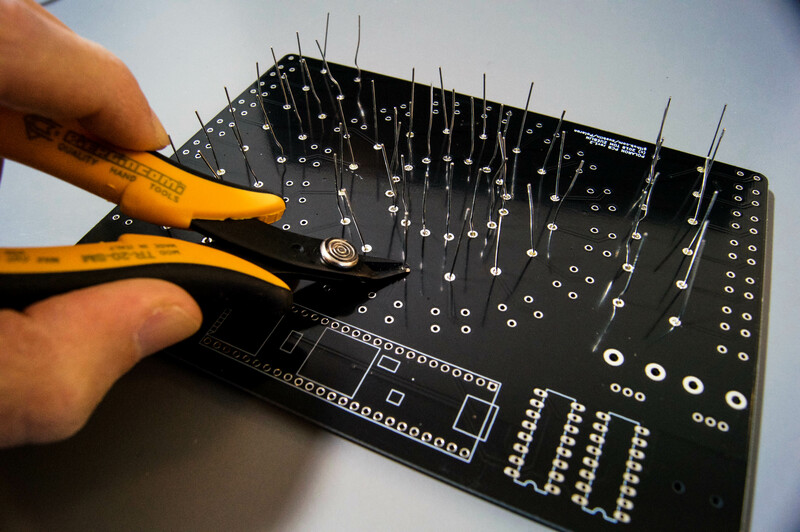 If you still want to, check Adafruits Guide to Excellent Soldering. Lets do the LEDs first. Its generally a good idea to start with the flattest parts first and do the bigger parts later, so they don't get in the way. The LEDs are temperature sensitive, its recommended to not heat them up for more than a few seconds at a time. 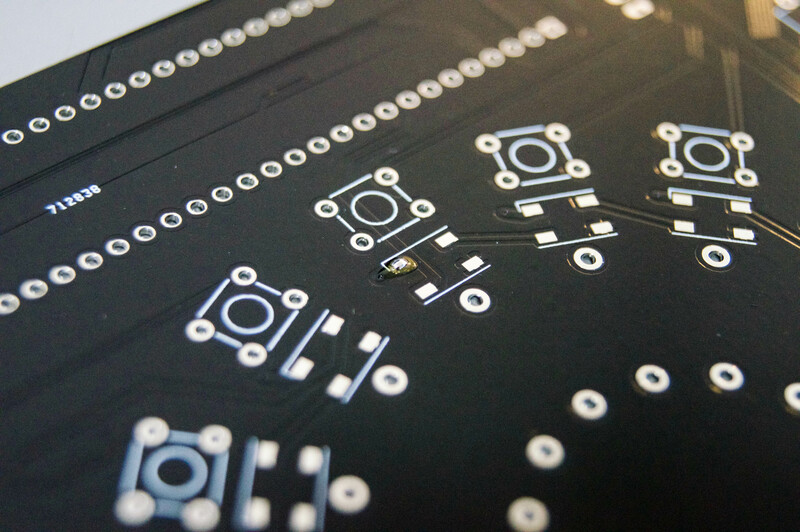 The orientation of the LEDs on the PCB is important, make sure you place it, so that the small triangle on the LED is in the same corner as the small (1mm) extra line of the part diagram on the PCB (top left corner in the image below). 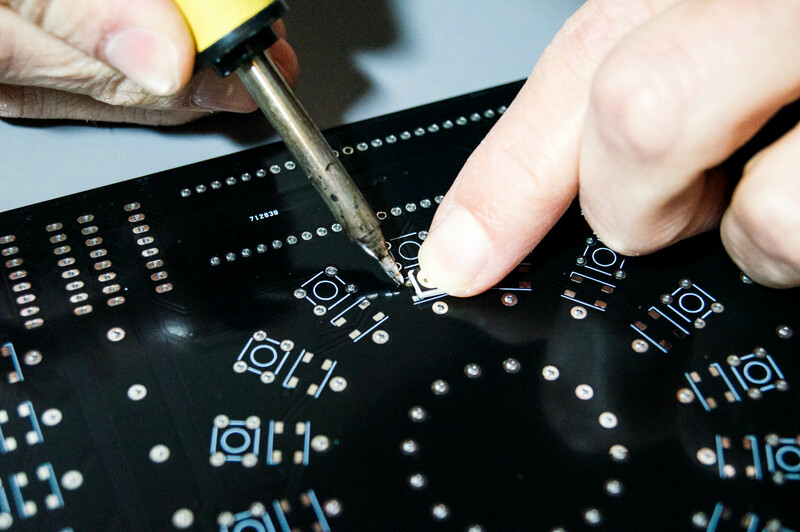 Reheat the dot of solder and press the part down. The part is now in place and should stay in position. 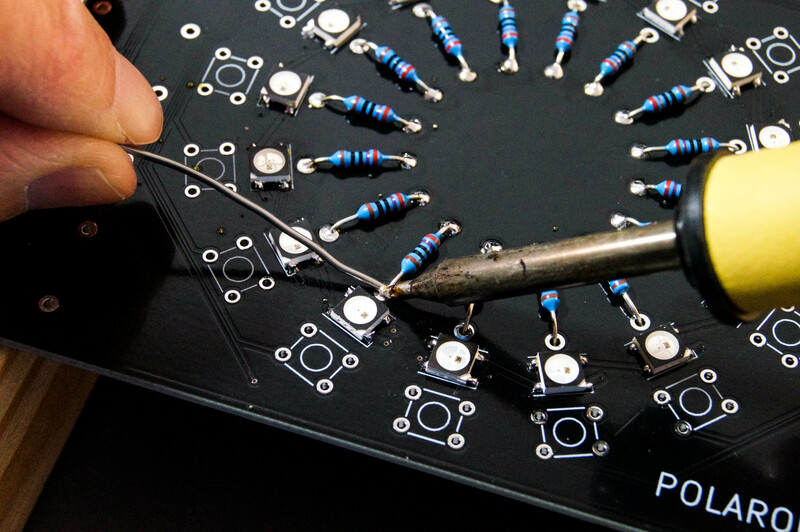 Correct the position if necessary by reheating the solder, but be careful not to overheat the LED. 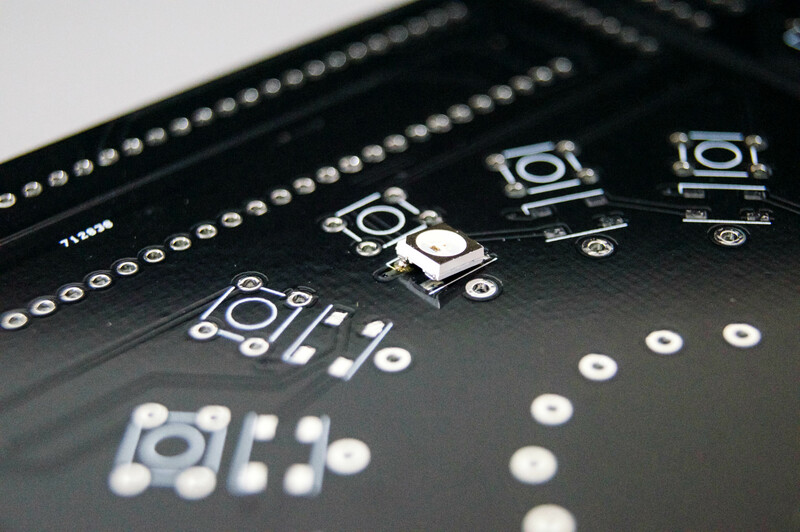 Make sure the LED is centered exactly with regards to the pads, if you use too much space on one side, it will be hard to solder on the other side. 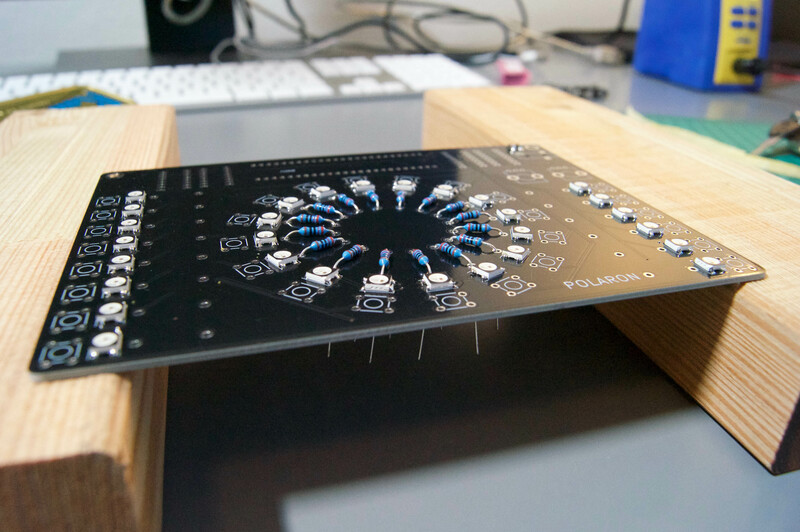 Solder all LEDs like this (I do the circular LEDs first, then the others). 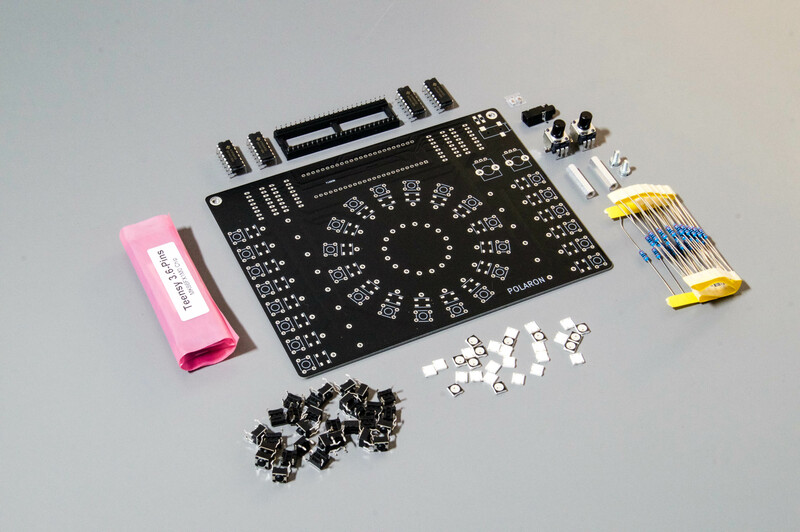 With a total of 120 points to solder its easy to forget some, so you might want to check all connections now. Soldering these two buggers is a bit tricky, as they are small as hell and if you don't use pliers you might burn your fingers (thats part of the fun). I use the same technique as for the LEDs, i.e. 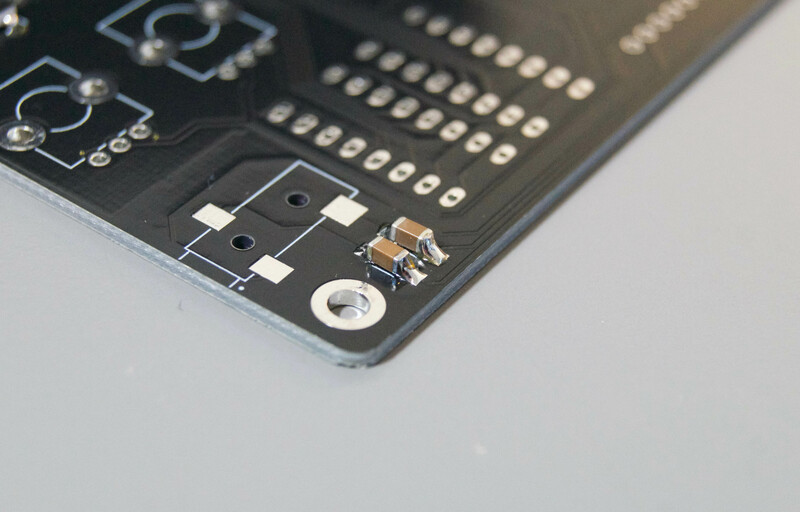 apply a small dot of solder onto the pad first and then reheat it to 'glue' the part onto the PCB. Then solder all connections. 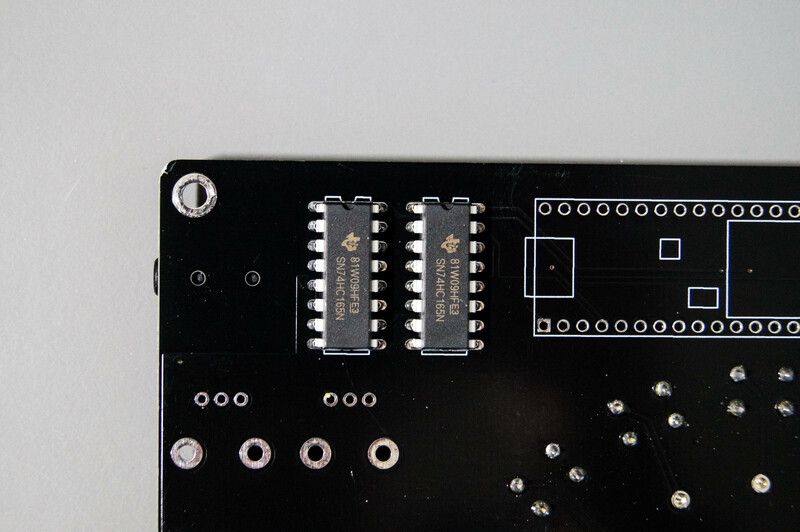 Solder: Normally, after sticking the resistors into their holes, you would turn the PCB upside down and solder the parts on the bottom side of the PCB. However i found that soldering them on the front side of the PCB has the advantage that the resistors are nicely held in place by our friend gravity (thanks for that) and in addition, since the bottom side stays fresh and clean when soldering like this, its easy to cleanly cut the remainder of the legs of at the bottom side afterwards (which is what you'll do after soldering all resistors). 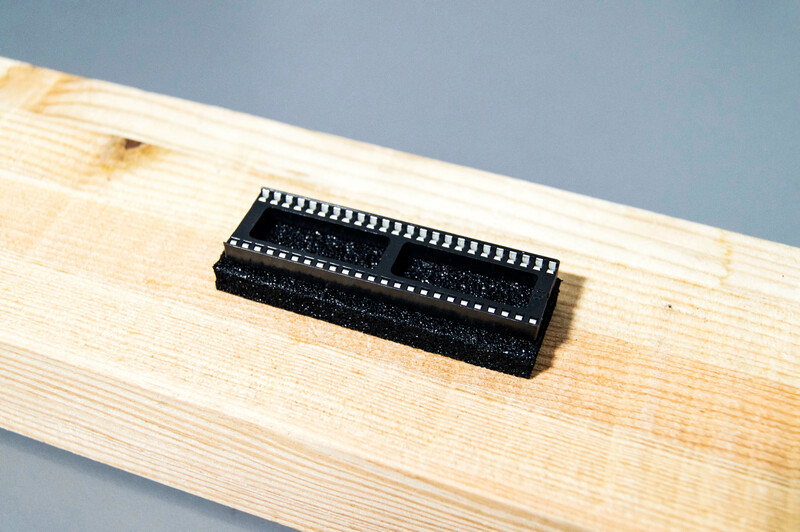 Its not easy to get a 48 pin chip into an IC Socket. It might need some force. I found that its easier to put the Teensy into the IC Socket, before soldering the Socket onto the PCB. For this, put the socket into the black isolation foam that comes with the teensy when you buy it and then press the teensy into the socket by carefully applying force from above. Last not least solder the two potentiometers. Thats it, we're almost done. Now is a good time to clean the PCB using a toothbrush (which you should use only for things like this afterwards..). 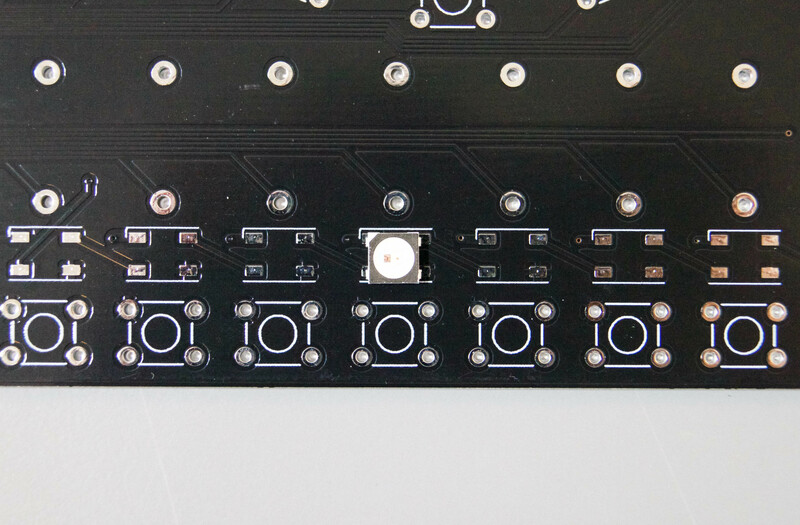 Then use the two small screws to attach the standoffs on the bottom of the PCB. Well done! Now go wild, have a beer or two, party, share some images and text your friends! 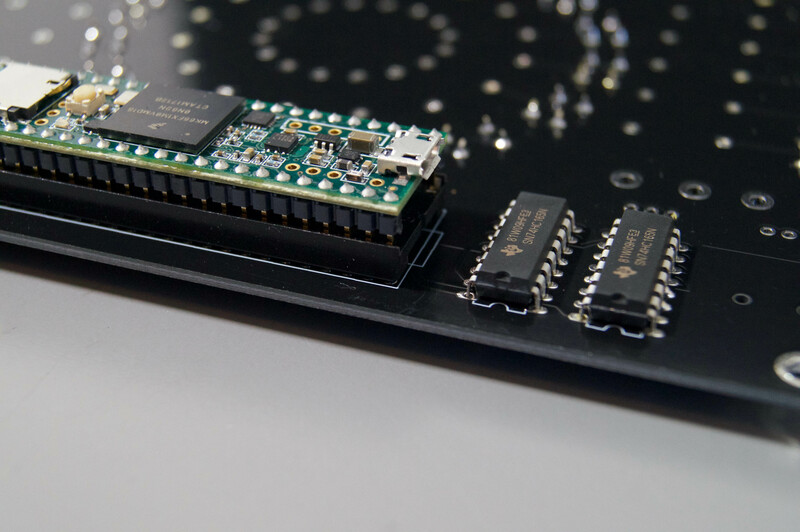 Now its time to Upload the Polaron firmware onto the teensy.